Casa Del Lago is a Fort Myers gated community, across the street from the Cypress Lake Nature Preserve that spans over two thousand acres. The preserve has miles of nature walks and educational seminars given by the park rangers. There are 197 single-family homes throughout this private community. Casa Del Lago’s 5,000 square-foot clubhouse provides a gathering place for friends residing in this lovely community. Residents use the fitness center, lighted tennis courts, and a basketball court to stay in shape. The clubhouse’s meeting room is a great place to mingle and partake in social events. Other amenities included a billiards room, an outdoor pool, and a playground for the grandchildren. Casa Del Lago is conveniently located across the street from the stunning Cypress Lake Nature Preserve that spans over two thousand acres. The preserve has miles of nature walks and educational seminars given by the park rangers. In 1997 Engle Homes began building single-family homes in Casa Del Lago and the community was completed in 2006. This gated community consists of 197 homes in a reserved tropical setting. 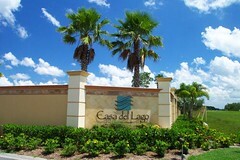 Casa Del Lago’s low-maintenance homes range from 1,735 to 3,092 square feet of spacious living. Houses vary from two to four bedrooms, two to three-and-a-half baths and have two-car garages. In addition, about half of the homes in the community have their own swimming pool. Residents at Casa Del Lago pay a reasonable Homeowners Association (HOA) fee per quarter that covers all homeowner and common area landscaping services, basic cable, in-home security monitoring, and access to the clubhouse amenities. In addition residents pay a yearly Property Owners Association (POA) fee that goes toward maintaining the 31 acres of wildlife preserves that back up to the homes. Posted on September 19, 2013, in Real Estate and tagged 33966, Bonita Springs Realtor, Cape Coral Realtor, Casa Del Lago, Estero Realtor, Fort Myers Realtor, Homes for sale in 33966, Kristen Pell, Property Guiding, Real Estate Biz, SWFL Real Estate. Bookmark the permalink. Leave a comment.